Oana DAVID is the President of The International Association of Cognitive-Behavioral Coaching, Director of the International Coaching Institute, Babes-Bolyai University and Associate Professor in the Department of Clinical Psychology and Psychotherapy, Faculty of Psychology and Educational Sciences. 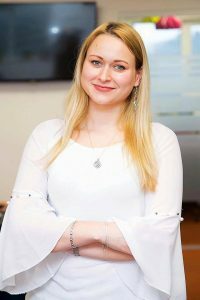 Oana David worked previously both as an internal Human Resources Consultant (Intesa Sanpaolo Bank) and external HR consultant (HILL International) and has coordinated various performance management, organizational development, and coaching projects. She has completed training, internships and research fellowship programs in the field of cognitive-behavioral coaching, psychotherapy and psychological counseling at Albert Ellis Institute, NY, USA; Centre for Coaching, UK; King’s College London, Institute of Psychiatry, UK; Laboratories of Cognitive Neurosciences, Harvard Medical School, Children’s Hospital Boston. Her interests are in developing innovative psychological tools in order to optimize two of the most valued areas of our lives: working and parenting. She is specialized in personal and executive coaching, parenting coaching, performance management, stress management, and well-being coaching. She currently conducts research projects investigating emotion-regulation mechanisms relevant for the workplace, brain correlates of emotion-regulation, and efficacy of technology-based coaching (i.e., online, using robotic devices, Virtual Reality procedures). Her first degree was in Engineering and second in Psychology. Loana worked as a Marketing Manager for 11 years and had her own company for another 11. Now she works in her private practice as a Trainer, Counselling Psychologist and as a Coach and studies Phd in Psychology at the Doctoral School of Evidence Based Psychodiagnosis and Psychological Interventions, UBB. She started the collaboration with IACBC as a volunteer in 2014 and soon she became the Executive Manager, occupying this position since 2016. In 2017 she was Training Manager in our association and now she is the Administrative coordinator. Her competences are in life coaching, executive and business coaching and her interests are in Stress Management and Personal Development. 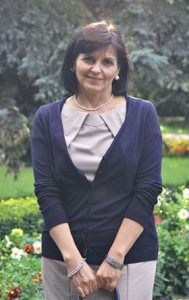 Cristina LORINȚ is a psychologist and trainer. She graduated from the Master of Psychology, Psychological Counseling, and Psychotherapy Program at Babeş-Bolyai University and is currently a PhD student at the Doctoral School of Psychodiagnostics and Scientifically Validated Psychological Interventions, UBB. Professional expertise includes soft skills and technical trainings, coaching and e-learning platforms and tools. Interest in coaching comes from the passion for learning in adults and from the experience as a trainer. As an IACBC team member, she is the coordinator of the volunteer team.